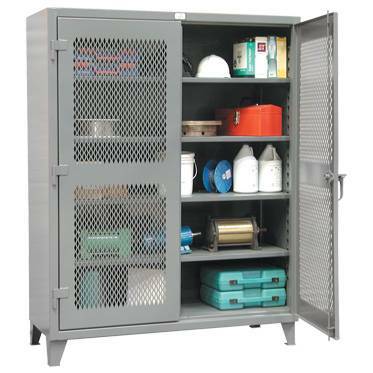 Custom Equipment Company carries a large selection of storage cabinets from Eagle, Jamco, Hallowell, Parent Metal, Pucel, Rousseau Metal, Strong Hold and other leading manufacturers of durable storage cabinets. Our industrial storage cabinet features both stylish design as well as other versatile options. Storage cabinets range from small wall hanging cabinets to heavy-duty industrial strength metal cabinets for warehouses, factories, machine shops, and general office use. Cabinets are used for short or long-term holding of materials, products and supplies in a manufacturing or distribution facility, industrial storage equipment holds positioned or placed items in an organized area set aside for them. Cabinets are primarily used for storage of products and contents you want to secure safely and out of harms way. They are effective in creating more space for production, warehouse storage and thoroughfares (pedestrian and motorized). Some options for cabinets are self-contained drawers, shelves, visual doors, special locks. These are commonly used in ndustrial plants for janitorial, tool / die, parts bins, computers and lab appliocations.